Large, soft bibs allow for neater, more comfortable mealtimes. Hook and loop closures makes the Terry Cloth Bib easy to put on. Made of 90% cotton/10% polyester. Reinforced with cotton binding. Bib measures 21" x 30" (53 x 76cm). Machine washable. Meets compliance law standards. 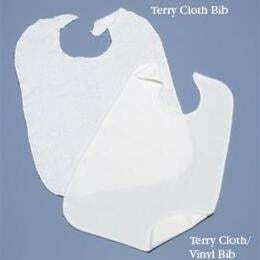 The reversible Terry Cloth/Vinyl Bib is terry cloth on one side and soft vinyl on the other. Neck opening fastens with hook and loop closures. Bib measures 18" x 27" (46 x 69cm). Machine washable. Meets compliance law standards.